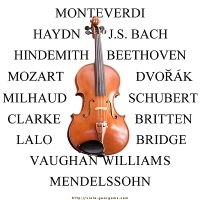 This design features a viola image surrounded by the names of fifteen prominent composers who played viola, among their other talents. (Bach, Beethoven, Britten, Bridge, Clark, Dvorak, Haydn, Hindemith, Lalo, Mendelssohn, Milhaud, Monteverdi, Mozart, Schubert, Vaughan Williams.) It will make a perfect gift for the violist or viola student, teacher or even composer who favors the viola – or maybe you want it for yourself! Buy this design now on a poster, clock, t-shirt, hoodie, bag, mug, mousepad or other quality giftware or apparel item, exclusively from Bratsche’s Viola Bazaar!